The American College of Greece | Stavros Niarchos Foundation: Deree’s Parallel Studies Program now a permanent endowment. Home » Why Give » Gifts of Note » Stavros Niarchos Foundation: Deree’s Parallel Studies Program now a permanent endowment. 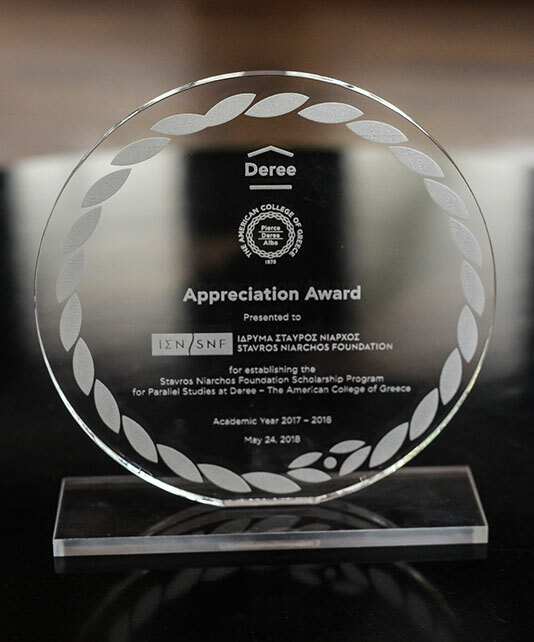 Stavros Niarchos Foundation: Deree’s Parallel Studies Program now a permanent endowment. In August of 2018, the Stavros Niarchos Foundation (SNF) transitioned its generous SNF Scholars Program grant from an expendable gift, into a $1.8M endowment to The American College of Greece in perpetuity. This program in past years afforded Greek public university students US accredited and EU-validated programs in pursuit of a minor to complement their studies at the Greek University. At present, this has been accomplished by some 300+ SNF Scholars through the opportunity of parallel studies on the Deree campus. Research has affirmed through tracking recipients of this program that the initial grant had become a valuable asset, both to the scholars and Greece’s economic potentials, while concurrently bridging public/private partnerships to new and available job market opportunities. Feeling the effects of the global financial crises for a full decade, many Greek public university students reflect the talent and abilities to excel in ACG’s undergraduate programs, but due to their socio-economic circumstances, have found that dream financially challenging. The Stavros Niarchos Foundation, as part of its earlier “Recharging the Youth Initiative,” has committed to its overarching goal to raise and enhance the economic conditions in Greece. The SNF Parallel Studies Program, in tandem with a series of activities including Mentoring and Internship initiatives, aim to tackle the challenging unemployment rates facing the Greek youth of today. As of this year, this generous endowment will energize the goals and dreams of even more selected Greek scholars in perpetuity. What for five years has been a substantial and exclusive donation by the Stavros Niarchos Foundation – greatly appreciated by The American College of Greece for helping to spread its reputation of excellence and goodwill, will now be a part of its legacy.